The battle between fire and ice is brewing in Westeros, a war that is about to have a serious impact on your cocktail hour (but with less bloodshed). Daenerys Targaryen—Khaleesi—Mother of Dragons, has suddenly flown into the limelight, positioning herself to take over the Iron Throne. In the past five seasons, she has birthed dragons from a smoldering fire, led her people across the desert, freed the slaves of Astapor, and has taught women worldwide how to wear a cape like a boss. And she deserves a drink. 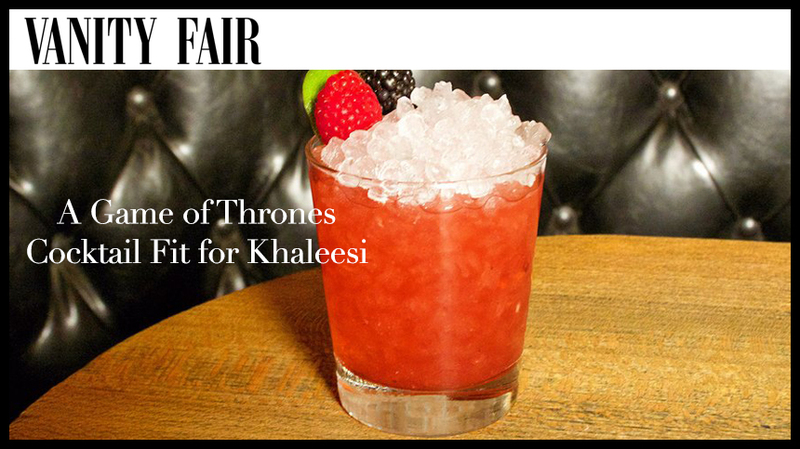 Jeff Bell, lead bartender of New York’s PDT, has crafted a “Mother of Dragons” cocktail just for VF.com. It’s based on a classic sherry cobbler, a summery but secretly boozy cocktail that is sweet, sophisticated, and fiery. Bell gracefully blends Casa Dragones Blanco tequila with fresh fruit, agave, Lustau Amontillado Almacenista, and a heavy dose of Hellfire shrub—a barman’s equivalent to dragon fire. The cocktail is garnished with a fresh raspberry, a blackberry, and a lime peel cut into a circle, representing the dragons eggs: one black, one red, and one green. It’s savory and smooth from the balance of tequila and sherry, with bright summer flavors of fresh berries and lime, ending with a kick of heat at the back of your throat. We can’t promise you’ll take over the Iron Throne, but you’ll definitely be breathing fire.